The violent clampdown by security forces has all but ended the possibility of a rapprochement with the Muslim Brotherhood. 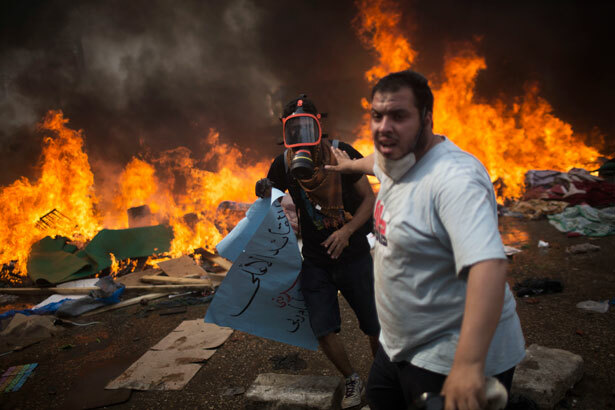 CAIRO—In one of the bloodiest days in Egypt in decades, security forces attacked two sprawling sit-ins of supporters of the deposed president, the Muslim Brotherhood’s Mohamed Morsi, shooting dead scores of people and igniting a wave of violence across the country. Hours after the raids began, Egypt’s military-backed interim president declared a month-long state of emergency, allowing security forces to detain civilians indefinitely and without charge, and imposed a nighttime curfew in Cairo and ten other governorates. Among those killed were two journalists, Mick Deane, 61, a cameraman for Sky News, and Habiba Ahmed Abd Elaziz, 26, a reporter for the Dubai-based newspaper Xpress. Muslim Brotherhood leader Mohamed El-Beltagi said his 17-year-old daughter, Asmaa, was also shot dead. In a press conference, the interior minister said forty-three policemen were also killed. Security officials said Beltagi and other senior Brotherhood figures, including Essam al-Erian, have been arrested. Morsi himself has been held in an undisclosed location since he was deposed by the military on July 3 following mass protests against his rule. Mohamed ElBaradei, a Nobel Peace Prize laureate and vice president of international affairs in the interim cabinet who had vocally urged against a forcible dispersal of the sit-ins, submitted his resignation over the crackdown. “I cannot bear the responsibility for a single drop of blood,” he said in a statement. “What happened today is only in the interest of advocates of violence, terrorism and extremist groups.” ElBaradei was the most prominent figure to take part in the transitional government following Morsi’s ouster, and his resignation underscored the fact that the military is the real power now in Egypt. Plans to forcibly disperse the two sit-ins had been previously announced, with the police stating that they would first provide a warning, then use gradually escalating tactics. The plans came in the wake of the interim cabinet authorizing the Interior Ministry to clear the encampments and amid shrill rhetoric in much of the media that often referred to the protesters as violent terrorists. The raids began shortly after 6 am, according to witnesses, with security forces deploying bulldozers, helicopters, snipers, shotguns and tear gas. The smaller of the two sit-ins, at Renaissance Square in Giza, was cleared within hours. But the raid of the much larger encampment, at the Rabaa al-Adeweya mosque in Nasr City, a neighborhood in eastern Cairo, lasted far longer. In Nasr City, the crackle of intermittent machine-gun fire punctuated the rhythmic clang of metal poles the protesters were beating to warn of the ongoing attack. Tear gas mixed with black smoke rising from burning tires and branches pulled from trees on the sidewalk. To enter or exit the sit-in, protesters were forced to sprint across a road exposed to sniper fire. Some took to writing their names and a number to call on their arms should they get shot. I saw one man scream as fell in the street after being hit in the head with what appeared to be birdshot. Protesters mostly responded with rocks, though there are reports that some used firearms as well against security forces. It was a scene of chaos and bloodshed inside the Rabaa medical facility, a four-story building near the central mosque. Wounded protesters were carried in every few minutes, many of them shot in the chest, neck or abdomen. The floor was covered in grime and, in places, slippery with blood. The heat was stifling, since the windows had been closed to prevent tear gas from entering. Overwhelmed doctors and volunteer medics were forced to tend to the wounded in the crowded hallways. “We only have two operating rooms, and we can’t transfer patients because the police are blocking the exits outside,” said Mohamed Abdel Aziz, a volunteer medic. On another floor, thirty-two corpses lay in neat rows, one of them badly charred and unrecognizable after being burned when his tent was set on fire. Eight more bodies lay shrouded on the floor above. Nearly all of the victims I saw were men, but at least one woman was carried in, blood seeping out of her headscarf from a gaping wound in the back of her skull. The interim cabinet lauded the dispersal of the sit-ins, claiming that the security forces exercised self-restraint and blaming the leadership of the Muslim Brotherhood for the violence. “The government holds these leaders fully responsible for any spilled blood, and for all the rioting and violence going on,” it said in a statement. The raids ignited violence across the country, with clashes breaking out in Alexandria, Ismailia, Suez and elsewhere. The Egyptian Initiative for Personal Rights, a leading human rights group, said the crackdown spurred counterattacks by Muslim Brotherhood supporters against Coptic Christian churches in Minya and Sohag, cities south of Cairo.